The statistic that has really stuck with me from the beginning of the semester is “In the 1990s, gunshot wounds cost $6 million per day– half of which was paid by taxpayers.” The goal of this quick exercise was to bring this ominous number of $3 million into something much more relatable, especially for Pittsburghers. Over 25,000 people commute into downtown Pittsburgh for work every day (source: FindTheData), and more people travel using the buses on a regular basis. 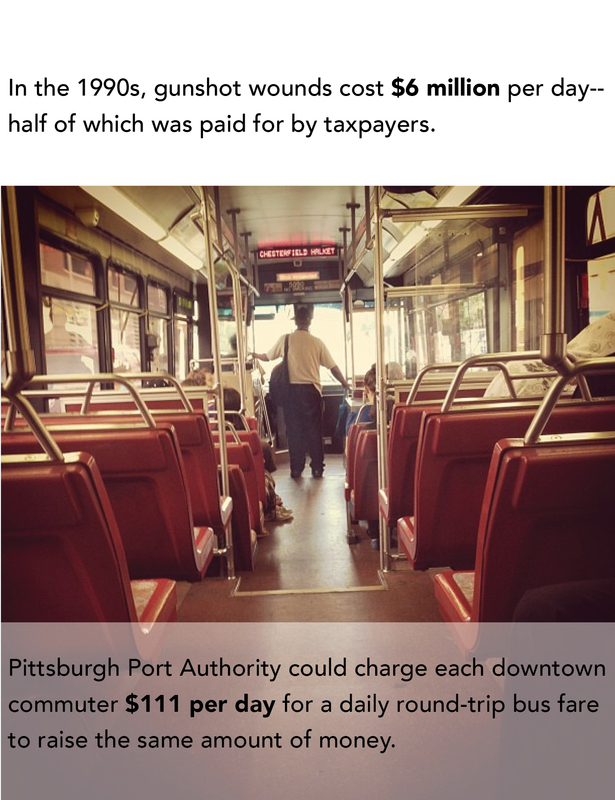 Many residents became outraged when the Port Authority raised the bus fare to $2.50 one-way, so I prompt people to imagine paying $111 just to commute downtown and back. So much money is going towards gunshot wounds, many of which are unintended shootings and completely preventable. By giving people this comparison, hopefully they begin to understand simply how much money is wrapped up in the issue of accidental shootings.